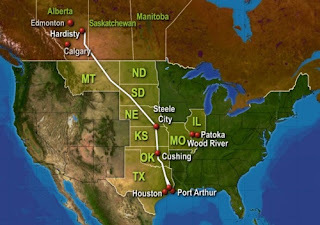 Oil Sand Box: Keystone being built, in Arkansas! Today I learned the Keystone XL pipeline is already being built! Unfortunately, it's in Arkansas. Welspun Tubular has made about 800 km of pipe for the line in Little Rock. If it can't clear the backlog it says it will start laying off workers. It's unclear if this pipe could be used in the already approved southern section of the line, which is about 650km long, or is meant for use in the unapproved section which is over 2000km long. My guess is that it's for use in the approved section but TransCanada is holding off starting construction until it knows the rest is going to be approved too. Tim Griffin, an Arkansas lawmaker apparently disgruntled at all the unused pipe littering up his state, says the decision on the project a "no brainer". He calls for more economic ties with Canada and less with other oil exporters that "don't like" America very much. I completely agree, but then I would wouldn't I?